When I was a little girl in Houston, my mother's closest friend had her mother living with their family. That was a little exotic to me because my grandmother lived in her own apartment across town. But Grandma Specter (that's what everybody called her) had her own room with her own rocking chair and it was always a little special to be allowed to go into her room for a visit. My main memories of her are in the kitchen, which is where she spent most of her time. She did a lot of cooking for the family. And one of the things she made fairly often were poppy seed cookies. They were soft and flaky, with that slight musty crunch . One time my sister asked her for the recipe. What she ended up with was "three handsful of flour, two of sugar, a spoon of this, a pinch of that . . ." My sister's one attempt to follow those instructions was such a disaster that she never tried again. But this wasn't why I chose poppyseeds for Barbara's TSIR challenge over at Tigers & Strawberries. I only had this memory after I had decided to use poppy seeds. One of the things I'm loving the most about Barbara's challenge is how it causes these long-buried memories to rise up through the accumulated layers of day to day routines and rituals and brings them front and center. 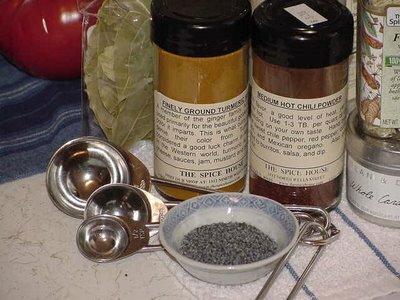 I never really thought about the fact that Grandma Specter, an Eastern European Jew, brought those recipes with her when she came to America, or that poppy seeds were a part of the tradition she brought with her. Poppy seeds have both a sweet and a savory tradition in Jewish cooking. 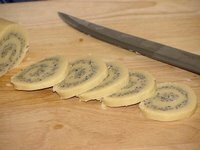 There are the cookies and the ultimate use of poppy seeds--hamentashen--but there are also poppy seed bagels, and challah is usually topped with poppy seeds. 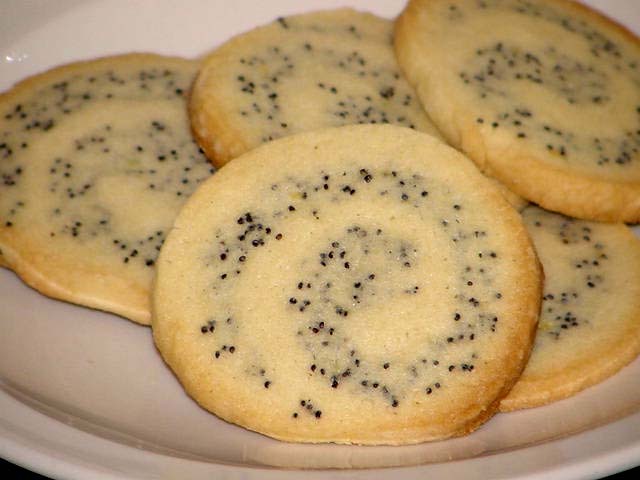 But I consider those more of a garnish, so I chose to consider my cultural reference to poppy seeds as a sweet one. I thought of trying regular poppy seed cookies, but I wanted to do something a little different. Before I could really do any research, though, a recipe popped right in front of me. (No more poppy puns, I promise.) 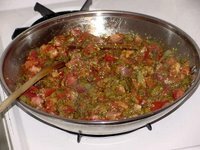 I regularly read through the recipes on the usenet rec.food.recipes group. Imagine my surprise when I saw that someone had submitted a recipe for Poppy Seed Spirals. It looked like something I could do. I am not an intuitive baker. I can read most recipes, and measure, and follow instructions, but I'm never sure how things are going to turn out. I don't bake often enough to be confident of my abilities with a rolling pin. But this seemed relatively easy, while being enough of a challenge to test my abilities. Mixing the dough was easy. Rolling each half out evenly was a bit more of a challenge, and it was a lot thicker at one end than the other. But it was a cylinder, and it was rolled, so I put it in the fridge to set for a couple of hours. The logs sliced up easily. And it was really cool to see the poppy seed spiral emerge. All in all, I was pleased with how it was shaping up so far. They took a little longer to bake than the recipe suggested, but I had trouble keeping my oven at the right temperature. While I love my gas burners, I think electric ovens are easier to regulate than their gas counterparts. But the cookies came out nicely, all the same. If I make them again I will add more lemon. It's a little too subtle for me. I don't think it should overpower, but it needs just a touch more presence. Now for the savory. I had no idea what, if anything, I could do with poppy seeds in a savory dish that didn't involve just sprinkling them on top of something else. But while searching for information on poppy seeds I came across a website dedicated to them. Big surprise, huh? 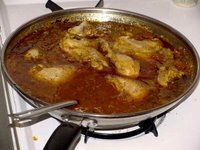 On that site I saw a recipe for Chicken Chennai. 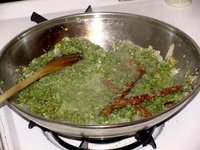 I don't know why so many of the recipes that are inspiring me these days are Indian. Maybe it's because as I've been researching healthy foods and cuisines, Indian spices and ingredients keep popping up. (Oops--that one was unintentional.) I do know that, as with everything else, the more practice, the better I get at it. After a little research, I still don't know that much about Chicken Chennai. I saw some references that said Chicken Madras should be renamed Chicken Chennai in honor of the recent change of the city's name, so maybe it's a version of Chicken Madras. Not all of the recipes that I saw had poppy seeds in them, but this one did and that was good enough for me. Since I found it on three different sites verbatim, without attributions, I'm not sure to whom credit should go. The first place I found it was poppyseed.org so I guess they should get the credit. A little mise en place. Chicken, tomatoes, cilantro-garlic-onion-poppy seed paste, and turmeric and chili powder. 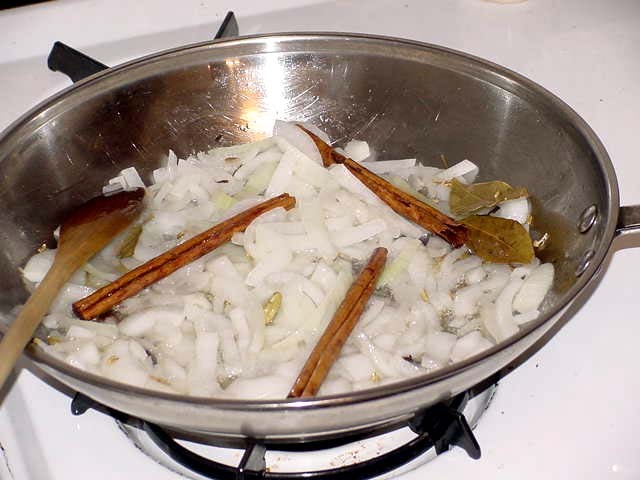 After frying spices for one minute, onions are added and cooked until browned. Add cilantro-onion-garlic-poppy seed paste and fry well. Add tomatoes and cook until oil separates (still haven't figured that one out). 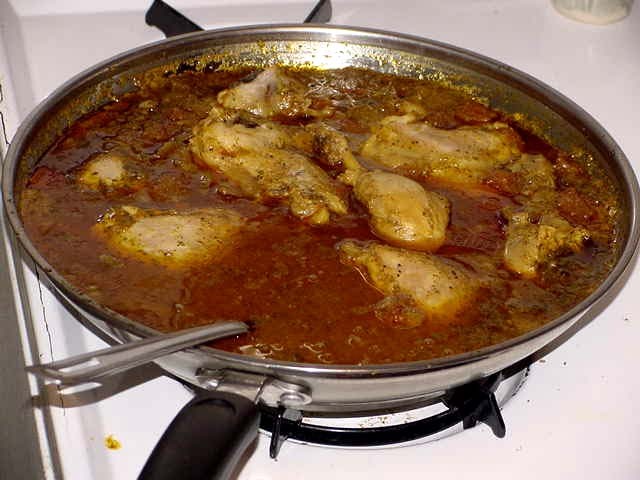 Add chicken, lower heat, cover and simmer until chicken is cooked. I added more sauce after I took the picture. It made a ton and was mighty fine. 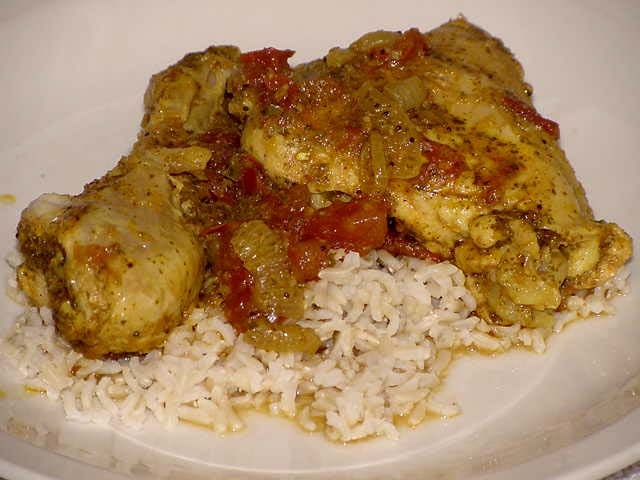 I don't know if this is an authentic Indian recipe or not, but I really enjoyed making it and eating it. It had heat and spice and tons of flavor. I will definitely be making it again. And I am emboldened to delve more deeply into the world of Indian spices and cooking. Thanks, Barbara. Your wonderful challenge has once again inspired me to reach just beyond my grasp, with spectacular results. This is long enought for one post. I'll post the recipes later. 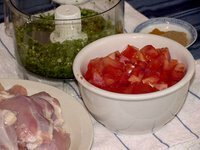 UPDATE: You can find the recipes here. Both recipes sound delicious! I am going to try them. Wonderful! Let me know how they turn out.